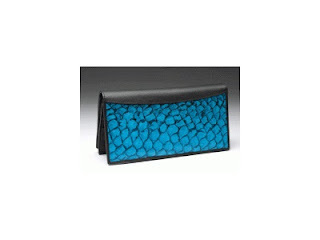 Legendary as the great underwater city, the "Atlantis" is the grandiose wallet of the Mermaid collection. It can swallow up to ten credit cards, unearth full notes in six compartments and conceal coins deep within its' zip purse treasury. A classic look for a modern lifestyle. Please call the office on 08 9071 5248 if you want to purchase the product offline. Perfect for women who are looking for a unique, Australian made purse or wallet that suits a modern lifestyle. Australia’s only specialist fish and shark leather tannery . . . born in the Golden Outback of Western Australia. From the ocean and outback estuaries to fashion houses, Mermaid Leather produces unique, aesthetically appealing and strong fish and shark leather. Designers throughout Australia have embraced the delicate pattern of fish leather for its soft sensual texture yet robust strength.